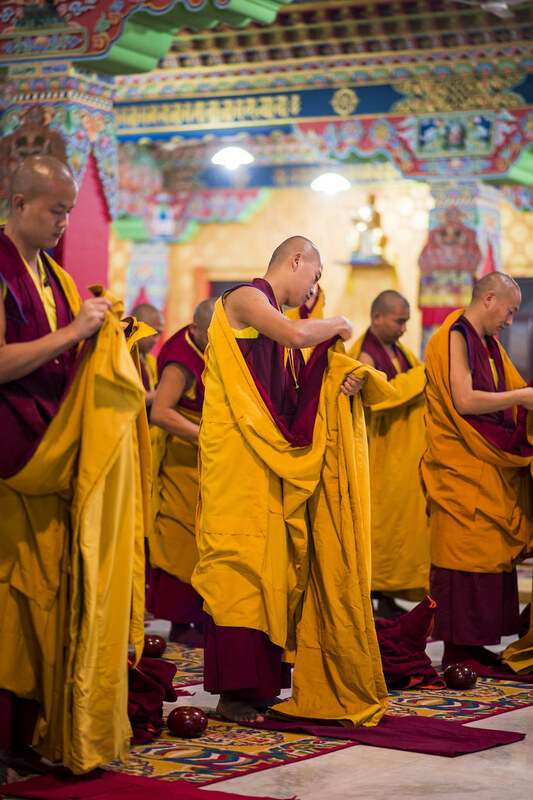 This extensive test of protocol for monks and nuns was established by the 17th Karmapa as part of the on-going programme to train up monks and nuns. In 2004 he issued a code of conduct for monastics based on both the Vinaya precepts set out during the life of the Buddha himself and ritual aspects unique to the Tibetan context. He then personally trained a core group of monks and nuns to take the instructions back to their institutions. Finally, he sent a team of senior monks, headed by the Ven. Yongey Mingyur Rinpoche, to tour all Karma Kagyu monastic institutions in India, Nepal and Bhutan, in order to check the conduct of the monks and nuns and, where necessary, train them further. The six major areas covered by the code of conduct are the correct way to wear the robes; the correct way to prostrate; the correct way to walk; the correct way to sit; the correct way to accept food and drink; and the correct way to chant offering prayers. The Karmapa himself began examining the sangha at the 25th Kagyu Monlam in 2007. In the beginning, only selected monks and nuns from participating monasteries and nunneries were called up to be tested but at the 31st Monlam in 2014 the test was extended to include everyone. Then, at the 32nd Monlam, also in 2014, the test was transformed into an annual competition and renamed the Grand Examination of Monastic Forms, with prizes awarded to the winners on the last day of the Monlam. Although more than fifty nunneries and monasteries join the Kagyu Monlam each year, only twenty-four core Karma Kamtsang institutions take part in the annual Grand Examination of Monastic Forms. There are prizes in two categories: gelong [fully ordained monks] and getsul and getsulma [novice monks and nuns]. In the latter category, monks and nuns compete equally against each other. This year’s competition was held over two evening sessions in the shrine room at Tergar Monastery. A lottery established the order for the test. One by one the monasteries and nunneries presented themselves in front of a panel seven judges. Getsul and getsulma had to show that that they knew how to wear all the robes properly, how to put on the red zen and the chögu [yellow prayer shawl], how to perform prostrations when wearing the prayer shawls, how to place the sitting cloth —the dingwa— on the floor properly, and how to receive tea and recite the tea offering prayers. Gelonghad many extra tasks. They had to demonstrate that they knew how to put on the namjar [the additional yellow monastic robe they wear], the tsesha [the large yellow hat], and the dagam [the warm winter cloak]. They then had to walk in a dignified manner while carrying dharma texts in the prescribed way, over the left shoulder and supported by both hands. These tasks were synchronised across the group to the beat of a wooden bell. The demonstration was timed, and extra points were awarded to those who completed the tasks most quickly and efficiently. The results will be announced and the prizes awarded in front of the great assembly on the final day of the 34th Monlam Chenmo Prayers.